Asian games 2018 India total medal tally is quite impressive. An outstanding performance by the 570 members strong Indian contingent, spread over 36 sports at the recently concluded Asian Games saw the country record it’s finest ever showing at the event. 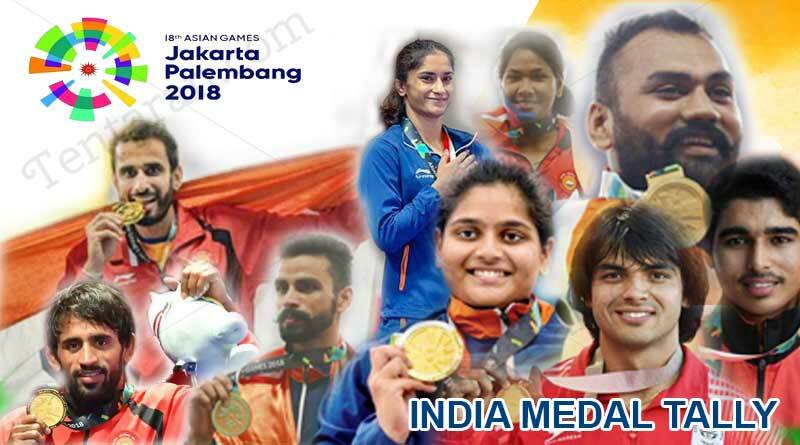 With 15 gold, 24 silver, and 30 bronze medals, India finished with a total of 69 medals to return the highest ever tally for the nation from Asia’s premier sporting event. Finishing eight in the final standings, India’s haul of 15 gold medals also equaled it highest ever gold tally which was achieved in 1951. Meanwhile, their tally of 24 silvers was the highest ever for the country at the games. Haryana was the chief contributor of India’s medals with athletes from the state once again flying the Indian flag high. A closer look at India’s showing at the games also highlights a heart-warming observation. More states contributed to India’s medal tally than ever with states that are not known for their sporting powerless giving medal winners. J&K, Himachal won one bronze; Madhya Pradesh a silver and two bronze; Odisha three silver and a bronze and Jharkhand two silvers, to show that India’s sporting culture is on the rise and the direction of development of sports in the country is on the right path. The subliminal showing by India’s athletes is a huge stamp on the athletes and their coaching staff’s efforts, long hours of dedication, practice hard work and never say die spirit. We bring you a medal breakdown of Asian games 2018 India total medal tally of the sports and events that the country fared the best at. India’s best showing came in athletics with the country recording a mammoth 19 medals from different categories. Such was India’s dominance over athletics that the nation brought in a total of 7 yellows from the event. It was a breakthrough and historic showing by the athletes in Indonesia, one that has put the future of India in track and field events in safe hands. A shooting was responsible for bringing in 9 medals of the country. There were divided between 2 gold, 4 silver, and 3 bronze. Despite the return being lesser than the 19 medals achieved in the CWG held earlier this year, the showing is still very impressive. Despite India’s wrestling face Sushil Kumar going down on day one of the competition, India’s extremely strong and talented squad ensured that the country returned from the game with two golds and one silver to their name. Bajrang Punia and Vinesh Phogat ensured that India bettered their one gold tally from previous games. For the first time in the history of the Asian Games, India saw themselves with a podium finish in table tennis. In a sport where the competition is as high as the Olympics with superpowers like China, Korea and Japan participating, India managed to buck the trend to bring in a historic first two medals for the country.